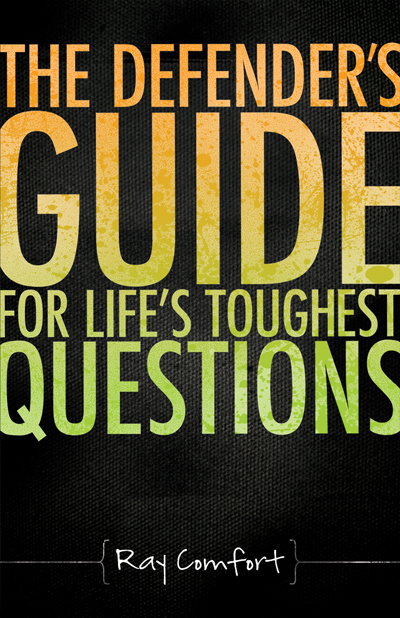 Hope's Cafe: Defender's Guide For Life's Toughest Questions-Book Review! 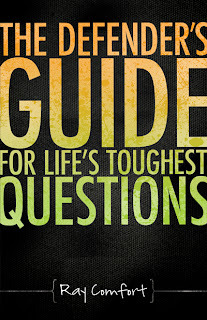 Defender's Guide For Life's Toughest Questions-Book Review! I remember the first time I ever heard of Ray Comfort-we were given a copy of his audio cd, "Hell's Best Kept Secret". After listening to that several times, I was hooked! We began purchasing some of his other materials, and I really enjoy all of them. His teaching and writing style are clear and easy to understand-even the children can grasp what he is teaching. So, when I was offered a new book by Ray Comfort, entitled "The Defender's Guide To Life's Toughest Questions", I was thrilled! This book is perfect for students in the secular academic system (or even some Christian schools and colleges), or for anyone who just wants to have answers for the questions skeptics throw out all the time. There are 5 topics covered; Humanity: Rights and Suffering; The Bible:Biblical and Theological Issues; Science: Scientific Thought and Evolution; Philosophy: Beliefs and Worldviews, and Religion: God and Atheism. Each topic has many questions that Christians commonly get asked, including Ray's answer to each question. One thing that really caught my attention was how Ray turned the "conversation" towards sin, salvation and eternity. This is something that we often miss out on, and focus on getting the other person to agree with us on a subject-evolution, fossils, no contradictions in the Bible, etc.-but leave out the most important part; where will they spend eternity, and how they can receive forgiveness. It was a good reminder for me, as I am guilty of this all too often. Another thing I appreciated with this book is that Ray doesn't avoid answering "hard" questions. He gives a clear, Biblical answer, and doesn't apologize for standing on the Word of God as the ultimate Authority. Many people want to be careful not to offend, and while Ray, obviously, is not trying to offend, he doesn't back down from the truth of the Bible. I highly recommend this book for anyone who is interested in being able to defend their faith, and answer the questions that are thrown our way so many times. If we don't have the answers for them, who will?! The Defender's Guide To Life's Toughest Questions can be purchased through New Leaf Publishing, here. I like the fact that he doesn't back down from the truth of the Bible. Sounds like a very good book.